Going on an adventure is fantastic. You know this for a fact. Heck, everybody does! But do you know who else thinks traveling is excellent? No, we’re not talking about a buddy you grew up with or your sister from another mother. We’re talking about that warm and furry little bundle of loyalty looking at you while you read this. (who’s probably wishing for a treat in a travel dog bowl). Man’s best friend has many names, but let’s go with the universally accepted one: dog. Born curious, dogs like to travel because they go wherever you go. It’s that pack mentality at work! You Should Pack for your Dog, too. If you’re taking your dog with you on a trip, you have to pack for you and your dog. 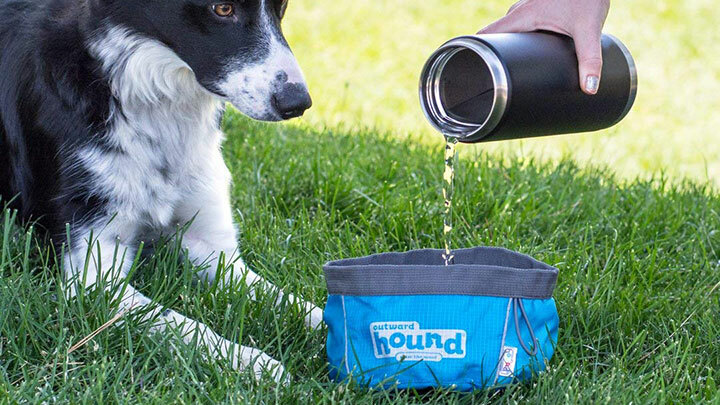 A travel dog bowl for water and food is essential to keep your pooch happy and fed. 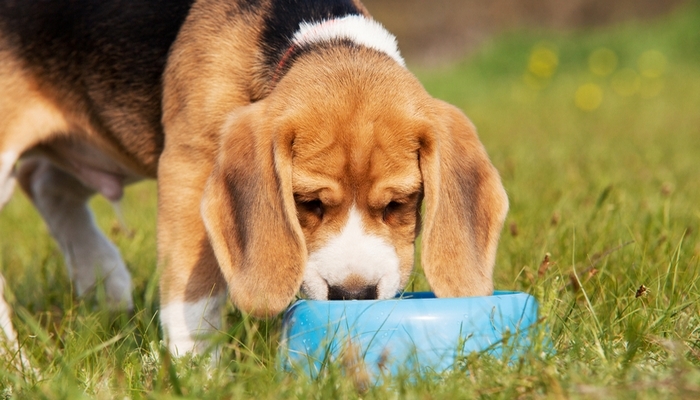 Your dog eating out of your own mess kit won’t work as well as you might think it will! Dogs need specialized gear so they can feed and hydrate properly. The last thing you want on the trip with you is a sick puppy. Plenty of things can go south if you fail to pack for your pooch. Drink from a dirty and polluted water source filled with contaminants. This will make your dog sick, and fast. Get bacteria or germs when he eats food out of the ground. Eat whatever she comes across if she’s hungry. This could include rotten food on the trail. A travel dog bowl is a must-have accessory in your adventure gear if Fido’s going with you. Here’s how to choose the best one for your best friend. When it comes to choosing a dog bowl for travel, you can get tripped up by the myriad of choices out there. A good rule of thumb is to establish a set of simple requirements so you’ll only end up with the best. The travel dog bowl must be safe enough even for human use. The bowl should be sturdy and leak free. The dog bowl should be lightweight and portable. The travel dog bowl should be collapsible and easy to clean. By using a set of guidelines, you’ll be eliminating everything that can harm your dog or give you a hard time when packing. You can add more or replace anything on the suggestions above. Use it as your basic template when you go out and buy a dog bowl for travel. There are many types of travel dog bowls out in the market. Let’s take a gander at the most popular ones, shall we? 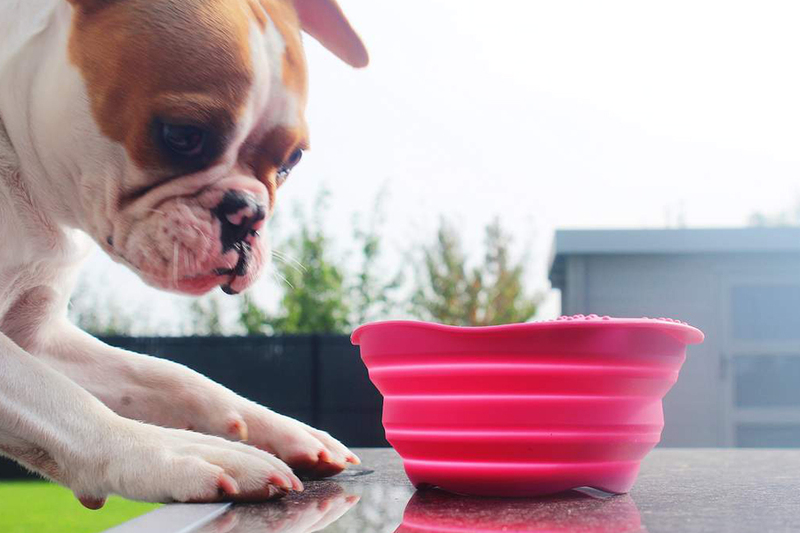 Most silicone dog bowls are made from BPA free, food-grade materials and are dishwasher safe. The containers are easy to clean and resistant to stains, scratches and bacteria buildup. Silicone is soft, lightweight and pliable, making it the perfect material for collapsible bowls. Travel dog bowls made from silicone fold flat, making them easy to carry around or pack in a bag. Pros: Folds flat, lightweight, BPA free and easy to clean. Cons: Your dog can easily chew it up. If your dog loves to chew up silicone, your next option is to go fabric. Yes, we know what you’re thinking: how can fabric hold food and water? Fabric dog bowls for travel are cool pieces of kit. 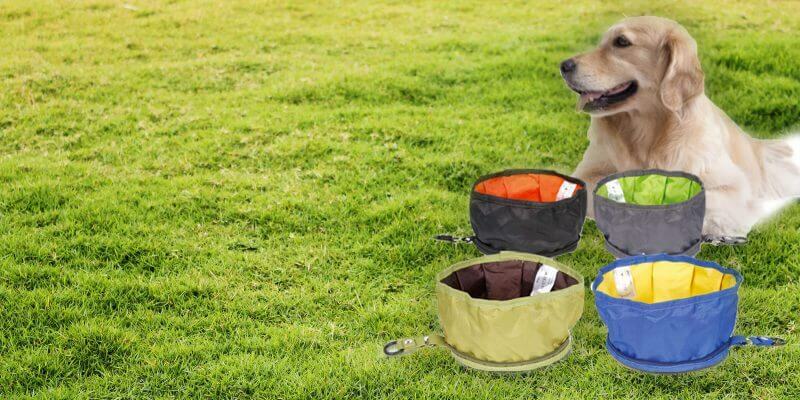 Fabric dog bowls are made from high-density Nylon and polyester. These bowls are the lightest and most portable of all travel dog bowls. These bowls can fold flat or collapse onto itself. Some even come with drawstrings so you can store dog food in them. The main gripe about fabric dog bowls is that it takes some time to dry. There also have been instances of water leaking out when used too long, so make sure to get one that is waterproof. Pros: Lightest travel dog bowl, ultra-packable because it collapses and folds. Cons: Takes time to dry, some models are prone to leakage. Classics never die, and the old reliable stainless steel dog bowl for travel is alive, well and ready to go. Stainless steel is the go-to material for home use dog bowls, so it stands to reason that it’s the best for travel, too. Stainless is ultra durable, easy to clean and impervious to scratches and bacteria. It’s lightweight, but not as light as silicone and fabric dog bowls. If you’re going for a stainless travel dog bowl, choose a no-spill one. Pros: Solid, durable, scratch proof, easy to clean, bacteria resistant. Cons: Doesn’t collapse or fold flat, heavy. Plastic dog bowls are the cheapest ones you can buy for travel. These are lightweight and solid enough to take a beating. Plastic containers aren’t the lightest, nor do they fold flat or collapse like an accordion for storage. We don’t recommend getting plastic dog bowls because not all use BPA, BPS, and phthalate-free materials. Cons: Prone to scratches and chew marks, which are home to bacteria. Some models use BPA and other hazardous materials. Not all travel dog bowls are created equal. Your primary consideration should always be quality. How much do you love your dog? If you answered too much, then you should get the best for him no matter what. You can be prudent, but the saying “you get what you pay for” is almost always the case when it comes to pooch gear. Cheap ain’t gonna cut it. Get the best, even if it means paying a bit more. It’s the right thing to do. What type of traveling is in store for you and your pet? This is a critical question to answer because not all trips are the same. A day trip to the beach isn’t the same as a four-day hike across the countryside. Once you know where you’re heading off to, it’ll be easier to decide what type of dog bowl to get. One of the primary considerations when choosing a dog bowl for travel is weight. Lugging around a heavy pack isn’t fun, which is why getting the lightest travel bowl is, so you and your dog don’t get weighed down. Always go for a travel dog bowl that is BPA, BPS, and phthalate free. These chemicals can wreak havoc on your dog’s health. When choosing a container for your dog, you have to make sure that even you can use it. There you have it, folks. Choosing the best dog bowl for travel isn’t hard if you go out there with a few basic guidelines. Remember, if it’s good enough for you, it’s good enough for your dog. If you are having trouble choosing, check out DogLab’s review of 32 different travel bowls!